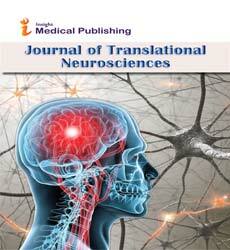 Journal of Translational Neurosciences is a world class open access journal willing to publish cutting edge research in Journal of Translational Neurosciences. Translational Neurosciences covers all aspects in diverse areas of neurobiology and developmental biology, including behavioral neuroscience, cognitive neuroscience, computational neuroscience, neural aging, neuro anatomy, neurosurgery, psychiatry, etc. Journal of Translational Neurosciences endeavors to publish basic, fundamental and advanced development research in not only above mentioned fields but many interrelated facets of Translational Neurosciences. Additionally the journal is willing to publish the research on sensory and motor systems, neural development, circadian rhythms, neuroendocrine mechanisms and the neurobiology of reward and motivation, etc. Insight Medical Publishing Group request and encourages researchers to submit their brilliantly orchestrated topics or recent developments in the field of Translational Neurosciences areas in the form of full length papers, reviews, comments, opinions, case reports, short communications etc. Open Access publishing from Insight Medical Publishing makes ones article visible and citable world over immediately. Molecular Neurobiology is the branch of neuroscience that covers the concepts of molecular biology and its application to the nervous system. Molecular neuro anatomy, Neuronal Development etc will come under the title Molecular Neurobiology. Now a days Synaptic neurotransmission gained its high importance on research platforms. Brain Disorders & Therapy, Current Neurobiology, International Journal of Neurorehabilitation, American Journal of Neuroradiology, Neuroscience Research, Neurotherapeutics. Behavioral Neurobiology/Neuroscience is also referred with different names like biological psychology, biopsychology, or psychobiology. It can be defined as the application of the principles of biology (in particular neurobiology) and it aims at the study of physiological, genetic, and developmental mechanisms of behavior in humans and non-human animals. Journal of Addiction Research & Therapy, Journal of Neuroinfectious Diseases, Journal of Neurological Disorders, Neuropsychology, Neurotherapeutics, Molecular Neurobiology. Neuropharmacology is a branch of neuroscience deals with the study of effects of drugs on the nervous system, including the brain, spinal cord, and the nerves that carry information to and from different parts of the body. The objective of neuropharmacology in general is to understand the basic functioning of impulses and signals within the brain in order to determine the drug actions to treat neurological disorders and drug dependence. Journal of Neuroinfectious Diseases, Journal of Neurology & Neurophysiology, International Journal of Neurorehabilitation, Neuropsychopharmacology, Journal of Neuroimmunology, Neuropharmacology, Molecular Neurobiology. Cognitive neuroscience is a branch of both psychology and neuroscience which deals with the study of higher cognitive functions in humans and its underlying neural bases. It is an integrative area of study drawing principally from cognitive science, psychology, neuroscience, and linguistics. Current Neurobiology, International Journal of Neurorehabilitation, Journal of Addiction Research & Therapy, Neurotoxicity Research, Neuroscience Research, Functional Neurology, Behavioural Neurology. The term neurobiotechnology is a complex science that includes studies related to anatomy, physiology, biochemistry, or molecular biology of nerves and nervous tissue and covers many of the devices used in neurosurgeries. It gives limelight on the development of the brain in the aging humans and other animals, gene regulation in neurons, chemical & electrical signaling in neurons or the neurological origin of the disease. Journal of Neuroinfectious Diseases, Current Neurobiology, Brain Disorders & Therapy, Journal of Neuroscience, Neuron, Nature Neuroscience, Nature Reviews Neuroscience. Developmental neuroscience (also termed Neural development) describes the cellular and molecular mechanisms by which mature nervous system comes into being during embryonic and post-embryonic development as a result of a series of developmental programs that comprise the birth of nerve cells and their supporting (glia) cells. Journal of Neurology & Neurophysiology, Journal of Neurological Disorders, International Journal of Neurorehabilitation, Neurochemical Research, Neuropsychology, Molecular Neurobiology, Neurotherapeutics. Nerve injury is define as the damage to both the nerve and the surrounding connective tissue. Nerves are delicate and can be damaged by pressure, stretching, or cutting and this injury to a nerve can cause loss of signals to and from the brain. The mildest grade of nerve injury is called neurapraxia, more severe grade is called Axonotmesis and most severe grade is called Neurotmesis. Nerve repair (Neuroregeneration) refers to the regrowth or repair of nervous tissues, cells or cell products and may include generation of new neurons, glia, axons, myelin or synapses. Current Neurobiology, Journal of Neuroinfectious Diseases, Journal of Addiction Research & Therapy, Neurology, Neurobiology of Disease, Journal of Neuroscience Methods. Neurobioengineering deals with the study and application of bio-compatible neuro-prosthetic implants, neural sensors, Neuro surgical equipment, Neuro electronics, softwares and interfaces with the nervous system. Brain Disorders & Therapy, Enzyme Engineering, Current Neurobiology, Experimental Neurology, Neuroradiology, Visual Neuroscience, NeuroReport, Molecular Neurodegeneration. Neuroendocrinology is the study of the interaction between the nervous system and the endocrine system, including the biological features of the cells involved, and their connection. The nervous and endocrine systems often act together in a process called neuroendocrine integration, to regulate the physiological processes of the human body. Current Neurobiology, International Journal of Neurorehabilitation, Journal of Neurology & Neurophysiology, Frontiers in Neuroendocrinology, Neuropsychology, Journal of the Neurological Sciences, Neuropsychology. Neurophysiology is a medical specialty that concerned with the relationship between the brain and the peripheral nervous system. Neurophysiology is in many ways a merging of neurology, which is the study of the human brain and its functions, and physiology, which is the study of the sum of the body’s parts and how they interrelate. Journal of Neurology & Neurophysiology, Journal of Psychology & Psychotherapy, International Journal of School and Cognitive Psychology, Neuropsychopharmacology, Psychological Medicine, Psychological Bulletin, Biological Psychology, Neuropsychology. Neuropathology is a branch in the field of medicine which deals with brain, spinal cord, and nerves tissue diseases and disorders. Experimental neuropathology also covers a wide range of topics including neoplastic, inflammatory, genetic, and neurodegenerative disorders. Journal of Spine, Journal of Novel Physiotherapies, Journal of Arthritis, Journal of Biomechanics, Clinical Biomechanics, Spinal Cord, Journal of Spinal Cord Medicine. Neurological Surgery is a discipline of medicine and that specialty of surgery concerned with the prevention, diagnosis, treatment, and rehabilitation of disorders that may modify the function or activity of the nervous system. It includes disorders of the brain, meninges, and skull, and their blood supply, including the extracranial carotid and vertebral arteries; disorders of the pituitary gland, disorders of the spinal cord, and vertebral column, including those which may require treatment by spinal fusion or instrumentation; and disorders of the cranial and spinal nerves throughout their distribution. Neurochemistry is the specific study of neurochemicals, including neurotransmitters and other molecules (such as psychopharmaceuticals, neuropeptides, or gastrotransmitters) that influence the function of neurons. This field closely examines how these neurochemicals influence the network of neural operation. Journal of Neuroinfectious Diseases, Journal of Neurological Disorders, Brain Disorders & Therapy, Neurotherapeutics, Brain Structure and Function, Neuropsychology, Neurotherapeutics. Neuroimmunology is a complex ﬁelds of biomedical research. It is defined as the study of the interaction between our central nervous system and our immune system, merges these two disciplines. Current Neurobiology, International Journal of Neurorehabilitation, Journal of Spinal Cord Medicine, Topics in Spinal Cord Injury Rehabilitation, SCI nursing. Neurogenomics is defined as interface of neurobiology and genome sciences. It gives idea about of how the genome as a whole contributes to the evolution, development, structure, and function of the nervous system. A main objective in neurogenomics is the isolation of genes linked to neurological diseases such as epilepsy, Alzheimer’s and Parkinson’s diseases. Journal of Neurology & Neurophysiology, Journal of Neurological Disorders, Current Neurobiology, Neuroscience, Journal of Neurology, Behavioural Neurology, Functional Neurology. As the name suggests the repairing of nervous tissues or cell products such as neurons, myelin etc. is known as neuro regeneration. This includes the generation of new neuronal cells as well as promoting axon regrowth and remyelination of damaged neurons. Journal of Neuroinfectious Diseases, Current Neurobiology, Brain Disorders & Therapy, Neuroradiology, World Neurosurgery, Visual Neuroscience, Neuropsychobiology. Computational neuroscience is define as the study of mathematical tools and theories which are used to investigate brain function. It is an interdisciplinary science that connections the various fields of neuroscience, cognitive science, and psychology with electrical engineering, computer science,mathematics, and physics. Journal of Neuroinfectious Diseases, Current Neurobiology, Journal of Neurology & Neurophysiology, Experimental Neurology, Clinical Neurophysiology, Neuroradiology, World Neurosurgery. Neural stem cells are defined as multipotent precursors and having capacity for self-renewal and the ability to differentiate into the major cell types of the central nervous system, including neurons, astrocytes, and oligodendrocytes. Stem cells give the flexibility to generate, repair, and change nervous system function. International Journal of Neurorehabilitation, Journal of Neurological Disorders, Journal of Neurology & Neurophysiology, Visual Neuroscience, Neuropsychobiology, Journal of Molecular Neuroscience, Neurotoxicity Research. Neuron protection comprises salvaging neurons through the use of targeted pharmacotherapies, protecting neurons through preconditioning, and repairing neurons by enhancing neurogenesis. Journal of Neurology & Neurophysiology, Journal of Neurological Disorders, International Journal of Neurorehabilitation, Current Neurobiology, American Journal of Neuroradiology, Acta Neuropathologica, Behavioral Neuroscience, Journal of Neurology. Nano materials and devices used or being developed for neurology applications like microfluidic or nano fluidic devices, tubes and nano chips etc. Journal of Neuroinfectious Diseases, Journal of Neurology & Neurophysiology, Nanomaterials & Molecular Nanotechnology, Brain Disorders & Therapy, Nature Reviews Neuroscience, Neurobiology of Disease, Journal of Neuroscience Methods. Neurobiology is the study of cells of the nervous system and the organization of these cells into functional circuits that process information and mediate behavior. It is a sub discipline of both biology and neuroscience. Current Neurobiology, Journal of Neurology & Neurophysiology, International Journal of Neurorehabilitation, Molecular Neurobiology, Neurotherapeutics, Neuroscience Research. Neural Computation is a multi-disciplinary term which requires the knowledge on psychology, computer science, neuroscience, and artificial intelligence. Models of neural computation are used to conclude the core principles that underlie information processing in biological nervous systems in an abstract and mathematical fashion. Journal of Neuroinfectious Diseases, Journal of Neurological Disorders, Journal of Neurology & Neurophysiology, Neurobiology of Disease, Journal of Neuroscience Methods, Journal of Molecular Neuroscience, Neurotoxicity Research. Neurological disorder define is a disease or injury of the central and peripheral nervous system such as brain, spinal cord, cranial nerves, peripheral nerves, nerve roots, autonomic nervous systemthat causes paralysis of any part of the body. These disorders comprise epilepsy, Alzheimer's disease, Parkinson's disease, brain tumours etc. The methods which allow the neurologists to image and diagnose the brain of the humans come under the umbrella of Brain Imaging. Brain Imaging helps to locate the area affected by the neurological disorders and to develop new methods to treat brain disorders. Journal of Addiction Research & Therapy, Current Neurobiology, Journal of Neurology & Neurophysiology, Brain Imaging and Behavior, Brain Pathology, Brain Structure and Function, Brain and Nerve. The examination technique of examining biological markers in the genome and proteome of Neurons by mixing molecular biology and medical testing. Journal of Neurology & Neurophysiology, Journal of Neuroinfectious Diseases, International Journal of Neurorehabilitation, Neurosurgery, Experimental Neurology, American Journal of Neuroradiology, Clinical Neurophysiology. Cell therapy or cyto therapy is the process of injecting cellular materials like DNA, Proteins etc into the human’s body, to interact with the living cells to treat with a number of diseases by self. Current Neurobiology, Journal of Neuroinfectious Diseases, Journal of Neurological Disorders, Annual Review of Neuroscience, Trends in Neurosciences, Lancet Neurology, Journal of Comparative Neurology. Neurosurgery is the medical department focused on the diagnosis and treatment of conditions, illnesses and injuries involving the nervous system and its support structures. This involving the nervous system for example brain, the spinal cord, the actual nerves, the skull, the bones of the spine, spinal disks, as well as the blood vessels, ligaments and the protective coverings that offer support to the nervous tissues. Journal of Neurological Disorders, Brain Disorders & Therapy, Journal of Neuroinfectious Diseases, Neuroradiology, Neurotherapeutics, Neurologic Clinics, Neuropathology, NeuroReport. The materials despite of being natural or synthetic, which helps to replace or treat brain tissues on interaction with biological systems. They compromise of biodegradable materials which are easily dissolved in the body. Journal of Biotechnology & Biomaterials, Biomolecular Research & Therapeutics, Nanomaterials & Molecular Nanotechnology, Neurology, NeuroImage, Annals of Neurology, Lancet Neurology. The process of transferring a drug or pharmaceutical compound in the body to target the affected part and to achieve its required therapeutic effect. International Journal of Neurorehabilitation, Journal of Neurology & Neurophysiology, Journal of Neurological Disorders, Neuroscience, Journal of Comparative Neurology, Neuropsychopharmacology, Journal of Cognitive Neuroscience. Neurogenetics is defined as the study of the role of genetics in the development and function of the nervous system. It considers neural characteristics as phenotypes, and is mainly founded on the observation that the nervous systems of individuals. Neurogenetics is related to both the fields neuroscience and genetics, focusing in particular how the genetic code an organism carries affects its expressed traits. Current Neurobiology, Brain Disorders & Therapy, Journal of Neurology & Neurophysiology, Journal of Neurosurgery, Brain Stimulation, Brain connectivity, Brain Cell Biology. Is Depression a Social and Reactive Phenomenon to Parkinson's (PD) or an Internal Symptom of the Disease Itself?